My administration created a shared service with the County of Union for our interim DPW director which has allowed us to repair the roadway and install drainage in areas like the lower Columbia road behind Columbia Middle School as well as fix a dangerous portion of Park Avenue. This agreement has allowed for the restructuring of the department allowing for improved delivery of services from snow removal to road repairs and beyond. Thank you to all the residents who have reached out to let us know how we’re doing! I am proud that we kicked off our E-waste (electronics) and Styrofoam recycling program. Our container was full this week after only our second Saturday Lines of cars waited to dispose of their unwanted electronics. We are saving the planet one Saturday at a time! Fiscal responsibility is the cornerstone of my administration. We are achieving this goal by instituting strict oversight over our contracts by adding a “not to exceed” limit to contracts and insisting on detailed billing, so we know what we are getting for our tax dollars. We continue to be vigilant in our oversight of the municipal complex project, which has had challenges with soil and drainage. But we remain committed to ensuring we tighten our belt and spend dollars wisely. All the redevelopment that is slated for construction over the next years is important to helping to pay for the municipal complex. My administration is working with developers on a daily basis to make sure we are pushing these projects forward. No stone has been unturned looking for outside funding. We are working with the County on a lease agreement for our new salt dome which will help underwrite the cost of construction and will be dedicated to paying down the debt we have incurred to construct it. Councilwoman Poage has spearheaded a Grants Committee to help identify funds ranging from historic preservation to federal funds with the help of Congressman Malinowski’s office. We still have more to do. I look forward to the next 100 days. I plan to bring forward an ordinance for an Economic Development Committee that will work to ensure connectivity to the Connell Park development. The committee will also be tasked with launching the Shop BH program, a property taxes rewards program that provides property tax relief when shopping or using Berkley Heights businesses. The business administrator and I have met with the company who launch the first program in Marlboro and we are excited about helping our businesses grow while saving our residents taxes. Since my tenure as Open Space Administrator for the County, my passion has always been active and passive recreation. I look forward to finding more opportunities to provide recreation for our community with outside the box thinking in 2019. 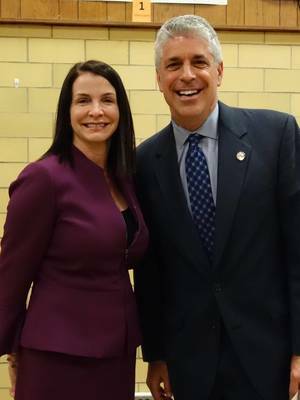 Finally, I thank the community for their support as we have transitioned into the new administration and carry out our vision for Berkeley Heights. I truly believe it is a privilege to be your Mayor.